Here at Bullet Garage Doors, we have been providing our customers in Aylesbury with high-quality garage doors for many years. With over 15 years of valuable experience in the industry, we have established ourselves as leading suppliers of garage doors in the area. Whether you are looking to renovate or replace your existing garage door, you can rest assured that we will provide you with the best possible solution. We currently supply a variety of garage doors, such as the retractable or sectional varieties, that are available for installation at your home. The team here at Bullet Garage Doors are more than happy to discuss a wide range of options with all of our customers, and we will work closely with you to ensure that you will be 100% satisfied with your decision. Once we have supplied you with an unbeatable price for your new garage door, a member of our fully qualified team will complete the installation efficiently, with a minimum amount of disturbance to you and your home. 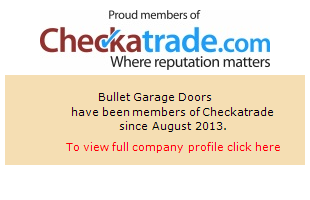 Our workers at Bullet Garage Doors also specialise in garage door repairs, and can provide this service to our domestic customers throughout Aylesbury. From weather damage to general wear and tear, garage doors are always susceptible to damage after time. Not only does a damaged door represent a potential health and safety risk, but it can significantly reduce the kerb appeal of your property. Our highly qualified team is able to visit your home and assess the damage, before providing you with an informed, practical solution. We also fully appreciate that damaged garage doors can hamper the security of your property and leave your valuable possessions unprotected. We guarantee that our garage door repairs will be completed in a timely fashion, allowing you to effectively secure your home once again. If you’re in Ayelsbury and in need of a garage door service, then Bullet Garage Doors are your best option. We’re based in Dunstable, just half an hour away via the A41, meaning we can be with you quickly every day. If you need any more reassurance, though, then head over to our testimonials page. On there, you’ll find plenty of reviews from our past customers. Finally, you can also check out our Checkatrade profile; with an average rating of 9.98 out of 10 across 132 reviews, it’s clear that we’re held in the very highest regard. For more information about our garage doors and the garage door repairs we offer, feel free to contact us today. You can reach us on 01582 932025 or 07880 542 433, or fill out one of our helpful online contact forms; our friendly team will be happy to assist you.